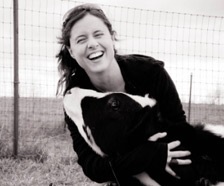 Award-winning photographer Jo-Anne McArthur, founder of WE ANIMALS, an ongoing project since 1998 to photograph animals in the human environment to build awareness of how animals are mistreated in our daily lives, speaks on Thursday, Oct. 5 at Hudson Valley Community College. The presentation, augmented with McArthur's beautiful yet often unsettling images, is at 7 p.m. in the Bulmer Telecommunications Center Auditorium on the Troy campus. WE ANIMALS uses photography to show that the animals we use for food, clothing, research, work, entertainment and companionship are sentient beings. Just like us, animals are able to perceive and feel. WE ANIMALS aims to break down the barriers humans have built that allow us to treat non-human animals as objects or property. By documenting human interactions with animals, WE ANIMALS hopes the viewer finds new significance in these ordinary, often unnoticed situations of use and abuse. Today, WE ANIMALS is an internationally-celebrated archive and more than 100 animal organizations worldwide have benefited from the project's work and continue to collaborate with McArthur on stories, investigations, campaigns and humane education. McArthur's first appearance in the Capital Region is not just for avowed animal lovers, but for anyone who would like to learn about the many campaigns to end animal suffering around the globe. McArthur's first book, also titled "WE ANIMALS," and others will be available for purchase at the event. The event is co-sponsored by the college's Cultural Affairs Program and Animal Outreach Club. With mostly student members, the club's mission is to educate others about animal abuse, and to assist and support animal rescue and shelter organizations throughout the region. The college also offers a certificate program in Animal Policy for those seeking a career in animal advocacy.